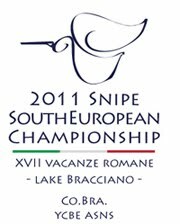 Snipe South European Championship 2011: SSEC2011 & Bracciano Sailing Committee on italian sailing media! SSEC2011 & Bracciano Sailing Committee on italian sailing media! The "Comitato Bracciano Sailing" got a huge regatta-schedule for 2011. As you know the Co.Bra will host the SSEC2011, and many other events as long as whole next sailing season. Down here a "google-trans" of an italian-written recent post about that, published on italian sailing media "Italiavela.it" (courtesy of..), so you can get an idea about which kind of "host" we're talking about..
From June 24 to 26 on the waters of Lake Bracciano will host the third edition of Lake Bracciano Sailing Contest, an international sailing event in 2011 will bring together as many as 8 classes with an expected participation of about 400 sailors. This year's program is enriched with the inclusion of a Match Race ISAF Grade 4 with the new One Design Gala, a monotype of 7.5 meters drawn from the study Vallicelli. The events of Lake Bracciano Sailing Contest 2011 are high-level and the outstanding leg of the circuit continental Europe Master Cup double in the Olympic class 470, the National Open Championship (open to foreign teams) and the Tornado Class Sailing National Open (open to foreign crews) of the Hobie Cat 16. In the field of racing catamarans is also provided for the participation of F18 and Class A. A complete schedule of events including a stage of the regional championships for the various categories Laser (the Standard and Radial Olympic and youth 4.7), double technical Snipe, the individual and the individual Olympic Contender acrobatic Finn who has also recently added a point on the circuit for the Italian Championship class Trident, from dinghies 14 'and 16' very common for novice to sailing, to show the utmost attention to basic training events. From July 22 to 24 will take place on the Snipe Class European Championship South and will be attended by about 120 sailors, including many top-class specialists in Europe. The event also coincides with the now ultraclassica Roman Holiday, which boasts a prestigious Hall of Fame and is now in its seventeenth edition. The highlight of the season will be the following week from July 29 to 31 with the Italian Championship for the Optimist class which will be attended by about 250 boys and girls between 10 and 15 years. During the event will be awarded cups AICO, AICO Rosa and Touring. In addition, the CO.BRA.SAIL. Blue Ribbon organize historic racing circumnavigation of Lake Bracciano at its XXXIX edition and reserved for all classes of dinghies and catamarans. Bracciano Sailing Committee has added another circle of the lake, also affiliated with the IVF and now collects all the clubs who have made the history of sailing on Lake Bracciano Ali6, Water Sports Association Sabazia Anguillara Sailing Association, Sailing Association Bracciano , Sabazia Sailing Association, Friends Sail Vigna di Valle, Bracciano Surf Center, Yacht Club and Sailing Club East Bracciano Trevignano, each of these circles has the operational capacity and experience to organize important national and international events of any class of sailing dinghies and catamarans . The event is organized under the auspices of FIV IV Area Committee, with the collaboration of the Consortium of Lake Bracciano and with the sponsorship of the Lazio Region, Department of Culture, Arts and Sports, the Province of Rome, CONI, Provincial Committee of Rome and Lazio Regional Committee. Of particular importance, as it demonstrates the satisfaction of the sponsor for the return of the confirmation of the image is the main sponsor, Capgemini Italy (www.capgemini.com), the largest multinational Consultancy, Information Technology and Outsourcing of European origin. Capgemini has always been sensitive to the sports world and particularly in those disciplines where teamwork el'affiatamento team make the difference, aspects that characterize the activities. Listed on the Paris Stock Exchange (Cap Gemini SA), transferring its customers solutions and expertise to help them achieve superior results through a unique way of working. This year's event will be hosted in two large properties in the Village of Sailing Trevor airport Vigna di Valle, Italian Air Force at the Sports Centre. Also this year there is the possibility to follow the races on the waters of Lake Bracciano aboard the motor vessel "Sabazia of the Consortium of Lake Bracciano, which will make a trip on the race courses for free hosting leaders and the public. Lake Bracciano Sailing Contest will be managed by an impressive organization that is committed to the ground and on three different race courses to accommodate the needs of different classes, plus the field that will be dedicated to Gala Match Race Class. For the Italian Championship Optimist there are two race courses. For the Southern European Snipe Cup race course. For the Blue Ribbon has provided a field of type long distance race for the circumnavigation of the Lake Depending on the events there are multiple different juries with judges for the arbitrator in the water. For every race course in an average operating water 15/20 people who take care of the laying of the race courses, assistance to the crews, assistance to the Race Committee and the referees and the connections to the naval base.